BenQ America Corp. has sponsored with Aurora — a free outdoor light and new media art exhibition being held in Dallas tomorrow, Friday Oct. 16. As a Cornerstone Sponsor, BenQ is providing mixed-media artists and curators with 50 HC1200 sRGB Colorific projectors and 50 QisDesign Seagull Light LED lamps. Aurora, in the Dallas Arts District, stages interactive new media art projects involving light, video, performance, and sound set in unexpected public placesHeld within the 68-acre Dallas Arts District, Aurora stages interactive new media art projects involving light, video, performance, and sound set in unexpected public places. 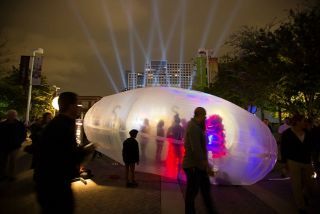 For one night every two years, the exhibition transforms downtown Dallas into one of the nation's largest outdoor showcases for contemporary art, featuring work by a confluence of local, national, and international artists. "In 2013, more than 30,000 people attended Aurora to marvel at 90 installations that redefined how art can be experienced; we are honored to support this inspiring exhibition again with our projector and LED lamp technologies," said Jan Spence, Associate Vice President of Marketing Communications and Branding at BenQ. "For Aurora, our HC1200 projector delivers award-winning color accuracy for unrivalled image quality, while the QisDesign Seagull Lamp combines a sleek, interactive design with energy efficiency and exceptional brightness. Increasingly sought out for creative projects, BenQ is quickly becoming a household name for artists, and we look forward to continuing our support of the visual arts community through sponsorship at innovative exhibits around the world." BenQ's HC1200 projector is purpose-built to follow the sRGB (standard Red, Green, Blue) industry color standard Powered by Colorific technology, the display combines sRGB color accuracy with up to twice as much ANSI contrast as typical LCD projectors.